Scientists have discovered that some ring-tailed lemurs in Madagascar regularly retire to limestone chambers for their nightly snoozes, the first evidence of the consistent, daily use of the same caves and crevices for sleeping among the world's wild primates. The ring-tailed lemurs may be opting to sleep in caves for several reasons, said University of Colorado Boulder anthropology Associate Professor Michelle Sauther, who led the study. While the cave-sleeping behavior is likely important because it provides safety from potential predators, it also can provide the primates with access to water and nutrients, help to regulate their body temperatures during cold or hot weather and provide refuge from encroaching human activities like deforestation, she said. "The remarkable thing about our study was that over a six-year period, the same troops of ring-tailed lemurs used the same sleeping caves on a regular, daily basis," she said. "What we are seeing is a consistent, habitual use of caves as sleeping sites by these primates, a wonderful behavioral adaptation we had not known about before." A paper on the subject appeared in the November issue of the journal Madagascar Conservation and Development. Funding for the project came from Primate Conservation Inc., the International Primate Society, the American Society of Primatologists, the National Geographic Society, CU-Boulder, the University of North Dakota, Colorado College and the National Science Foundation. Although sleeping in caves by ring-tailed lemurs—which are found only in Madagascar—has likely been going on for millennia, it is only now being recognized as a regular behavior, said Sauther. The endangered Fusui langurs, slender, long-tailed Asian monkeys roughly 2 feet tall, also have been documented sleeping in caves but as a direct result of extreme deforestation, moving from cave to cave every few days. There also have been isolated reports of South African baboons sleeping in caves. Ring-tailed lemurs are easily identified by their characteristic, black and white ringed tails, which can be twice as long as their bodies. They weigh roughly 5 pounds with a head-body length of up to 18 inches and are highly social, congregating in groups of up to 30 individuals. Sporting fox-like snouts and slender frames, they are unusual among lemurs, spending a considerable amount of time on the ground feeding on leaves and fruit and socializing, said Sauther. In "gallery forests" near rivers, ring-tailed lemurs regularly sleep high in the canopies of tall trees. But in "spiny forests," most of the trees with woody stems are covered in rows of spines, making them uncomfortable as well as dangerous sleeping sites because predators can easily climb them, Sauther said. The new study documents their cave sleeping behavior in the dry spiny forest habitat adjacent to limestone cliffs. A video of lemurs using caves. 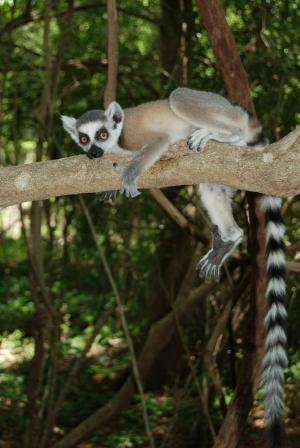 The lemur observations were made at the 104,000-acre Tsimanampesotse National Park and the Tsinjoriake Protected Area in southwestern Madagascar between 2006 and this year. The research team used field observations and motion-detector camera traps to chart the behavior and movements of 11 different troops of ring-tailed lemurs. One of the early clues to the cave sleeping by the lemurs was their presence on limestone cliffs adjacent to spiny forest trees or on the ground when Sauther's research team arrived at the study sites early in the morning. "They seemed to come out of nowhere, and it was not from the trees," she said. "We were baffled. But when we began arriving at the study sites earlier and earlier in the mornings, we observed them climbing out of the limestone caves." The primary predator of the lemurs is a cat-like, carnivorous mammal called a fossa native only to Madagascar that is closely related to the mongoose and may weigh up to 20 pounds. Fossil evidence shows a cougar-sized relative of the fossa that only became extinct several thousand years ago likely preyed on lemurs as well, she said. There is evidence that some early ancestors of humans in South Africa may have used caves to protect themselves from predators, said Sauther. The remains of hominids going back several million years have been found inside or near limestone caves there, and some fossil bones have evidence of damage consistent with the bite of saber-toothed cats. "We think cave-sleeping is something ring-tailed lemurs have been doing for a long time," she said. "The behavior may be characteristic of a deep primate heritage that goes back millions of years." Co-authors of the new study included Associate Professor Frank Cuozzo of the University of North Dakota, Ibrahim Antho Youssouf Jacky, Lova Ravelohasindrazana and Jean Ravoavy of the University of Toliara in Madagascar, Krista Fish of Colorado College in Colorado Springs, Colo., and Marni LaFleur of the University of Veterinary Medicine in Vienna. Fish and LaFleur are former CU-Boulder students of Sauther. Sauther co-directs the Beza Mahafalay Lemur Biology Project in southwestern Madagascar with Cuozzo, a former CU-Boulder doctoral student. Centered at the roughly 1,500-acre Beza Mahafalay Special Reserve, the research focuses on how climate- and human-induced change affects lemur biology, behavior and survival. Sauther and her team were aided by field observations made by students and faculty from the University of Toliara in Madagascar. In addition, undergraduate and graduate students from CU-Boulder regularly travel to Madagascar to conduct research under Sauther, including students from CU's Undergraduate Research Opportunities Program, which provides hands-on research and fosters student-faculty relationships. "I never thought I would have a chance as a CU undergraduate to conduct research in an exotic place like Madagascar," said former UROP student Anthony Massaro, who was part of a team that trapped ring-tailed lemurs, measured their physical characteristics including dentition, and released them back into the wild. "Dr. Sauther and Dr. Cuozzo mentored and guided me through the process of creating and conducting a unique research project." Unfortunately, habitat destruction, including deforestation, is increasing in many parts of Madagascar. In southwestern Madagascar, trees are being harvested for cattle forage, construction materials and firewood, and the mining of limestone there—used for the production of cement, fertilizer and other products—is increasing. Ring-tailed lemurs are now listed as an endangered species by the International Union for the Conservation of Nature's Species Survival Commission. Sauther has been conducting research on Madagascar for 25 years, beginning as a University of Washington graduate student. Today she has several CU-Boulder doctoral students working with her, including James Millette, who is studying how the tooth wear of lemurs relates to their foraging behaviors. "Madagascar is a challenging place to conduct research," Millette said. "Part of our job is to work with local communities, because without the support of these people there would be no lemur conservation. We consider Beza, where we have been working with the community for several decades, to be a real success story."